Finance ministers and central bank governors of the world's 20 biggest economies agreed to focus on boosting employment and economic growth. The fight against tax evasion by multinational corporations and measures to ensure recovery amid the global economic turbulence came into the limelight at the two-day meeting of Group of 20 finance ministers that finished in Moscow on Saturday. Finance ministers and central bank governors of the world's 20 biggest economies agreed to focus on boosting employment and economic growth and continue the policy of monetary support where needed, according to the closing communique from the meeting. To make that growth possible, the officials agreed to develop an action plan to be presented at the summit of the G20 leaders in September. The plan will include “a comprehensive series of structural reforms that will increase productivity, labor force participation and employment,” the communique said. Among such reforms is a major tax move proposed by the Organisation for Economic Cooperation and Development and aimed at increasing the transparency of taxation systems globally. At the request of the G20 finance ministers, the OECD developed a plan that the organization said marks a “turning point in the history of international tax co-operation” and is expected to benefit countries like Russia, which impose relatively high taxes. 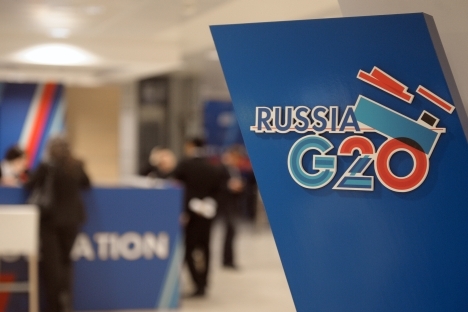 The initiative, presented by OECD Secretary General Angel Gurria on Friday, won high praise from G20 financial officials and will be submitted to G20 leaders for approval in September. “It's a specific action plan that our countries should implement to minimize the scale of tax evasion by major taxpayers,” Russian Finance Minister Anton Siluanov told a news conference Friday. In an extensive plan to be enforced within the next two years, the OECD outlined 15 specific steps to prevent tax evasion by big international companies. “International tax rules, many of them dating from the 1920s, ensure that businesses don't pay taxes in two countries — double taxation. This is laudable, but unfortunately these rules are now being abused to permit double non-taxation,” Gurria said in a statement. Among the steps envisaged by the plan are requiring multinationals with operations abroad — like Google, Starbucks and Apple — to pay local taxes on any profit they get from sales in an overseas country and provide tax authorities with a breakdown of profit, sales and taxes in every country of presence. The plan also calls for a more effective mechanism of dispute resolution and tougher legislation regulating the activities of companies' offshore subsidiaries, which often accumulate the entire profit with no taxes being levied on it. The measures were revealed just a day after Google faced accusations of long-standing tax evasion in Russia. Federation Council member Ruslan Gattarov claimed last week that the Internet giant violated the country's tax law by carrying out financial transactions with some local entities bypassing its Russian subsidiary. The company denied the allegations, Itar-Tass reported. The recommendations outlined in the plan are aimed at supporting countries offering high tax regimes, like Germany or Russia, which are likely to benefit from implementing the initiative, said Mikhail Filinov, a partner responsible for international tax structuring services at PwC in Russia. At the same time, they put pressure on countries with low tax regimes, like Cyprus and Luxembourg, which contribute to unfair tax distribution globally, Filinov said. The Finance Ministry and Federal Tax Service could take into account the OECD's recommendations and include them into the guidelines of the country's tax policy for 2014, he added. “Great plan,” Siluanov said. He added, however, that its implementation in each specific country remained at issue. He called for the initiative to be enforced globally since its implementation in one country or a small group of countries was unlikely to yield results. To make the effort efficient, the countries might sign multilateral agreements on preventing double taxation rather than amending existing bilateral documents, Siluanov said. Gurria pointed out that there are a total of 4,000 bilateral agreements on the subject at the moment. “The question is how long it will take to review all those agreements,” he added, Itar-Tass reported. He said the OECD might draft an international convention to avoid amending thousands of bilateral deals. If the OECD plans are realized, there will be a major change in international tax planning both for taxpayers and tax professionals, Filinov said. “For the first time, countries agreed on a joint plan to track tax regulation issues beyond their own borders and take into account the peculiarities of other tax systems while setting their own regulations,” he said. The other key issue that was in focus at the meeting of the G20 finance ministers was the quantitative easing policy, which is being pursued by the countries' central banks to stimulate economic recovery. Siluanov pointed out that wrapping up monetary stimulus measures amid economic stagnation would be premature. The quantitive easing policy involves purchases of government securities by central banks to increase the money supply. “Quantitative easing is justified amid economic stagnation, it doesn't even lead to higher inflation,” Siluanov said. His comments appeared after indications by the U.S. financial authorities that the country might soon start wrapping up its quantitative easing program triggered a sell-off on emerging markets. “Future changes to monetary policy settings will continue to be carefully calibrated and clearly communicated,” the document said.